When i am in the middle of typing a new message, if someone sends me a message the cursor is removed and i am left typing a message that is not actually going into the input box. The software shouldn't take my focus away from typing just because a new message is received. This is a two parter, firstly and primarily I think adding support for the open source chat protocol matrix .org this could help serve as a way of integrating Ryver with other chat systems when you need to communicate with someone who doesn't want to or can't use Ryver for some reason. Could probably work with most other chats and there are already support for many like Slack, Twitter, IRC etc. For the second part, Ryver could support adding a channel that exists on two different accounts at the same time so if two companies need to cooperate and both use Ryver they can have a common channel instead of one of them inviting all the others as guests. By implementing Matrix support I think this could be achieved. Maybe an even better solution could be made with your own protocol alone but this would be an added benefit to supporting Matrix and should not need any additional work. I assume this also affects Zapier integrations as well, however I haven't tested it. It would be useful if these messages weren't grouped, as it could cause confusion with whether messages are being sent by Zapier integrations, Hubot instances, other API usages or even by the user themselves. Messages display with the most recent at the bottom near the chat entry field, however Posts and Files display with the most recent items at the top. This inconsistency in display order is disconcerting to some users. Allow users to choose the order in which their messages and content display. It would be great if the actual page title (mainly in desktop) could have the active forum name or private team name or direct message user name in it. This would accomplish 2 things for us: First, the conversation could be found easier in the system tray and secondly, since we use TimeCamp, our billing app, it can track the active application and read that page title to determine what client should be billed for the time spent in that active chat session. So if the account we use is called "xyz", our current page title is always "xyz" (in the desktop app) or "Ryver: xyz" (in web app). And if we were to click on the Open Forums named "Client X", the title doesn't change. If you could append the forum name so that it shows as "xyz - Client X" (desktop) and "Ryver: xyz - Client X" that would be awesome. The /giphy command is cool and I can see how people would like it. I have to moderate several forums full of high school students though, and they'll spam the chat with /giphy's to the point that it's unusable. Being able to delete chats would be helpful for this as well. As in Slack there is just one conversation group, namely Channel. Ryver has 'Open Forum' and 'Private Team'. Which does incline you for a team to start a 'private team'. But then again, it is better to have as much open communication as possible. But anyway, why not integrate OpenForum and PrivateTeam into one group. As the only difference is whether the group is open or closed. It could be called 'Forum' for example. When I type @person there is normally formatting that places it in a grey block. But if I type for example (@person) this fails (any time there is a charachter infront of @) but there seems to be a notification sent anyway. When I receive a message on the Windows client and immediately click on Ryver on the taskbar there is a delay (several seconds) before the window actually opens. I started noticing this recently, I don't think it always happens could be something like only the first message or only some kinds of notifications. If anyone else has experienced the same problem feel free to add a comment to make sure this is not something only affecting me. I'm currently using Windows 7 and desktop client Ryver 1.1.6 (Complete Cats). Hi I lead a team of 170 individuals. 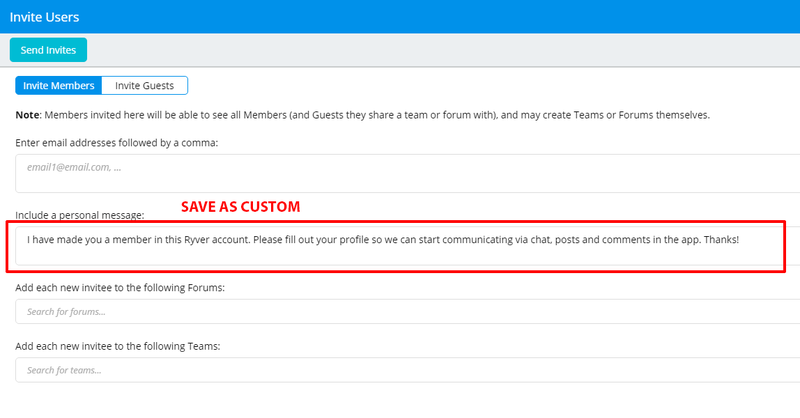 It is a real pain to invite team members first and then change their status as admins/owners later, especially since I have to invite a lot of people (nearly 30) as admins at once. And PLEASE ADD AN OWNER LEVEL. it would be nice if a custom message could be saved instead of writing it over and over. once i open ryver mobile app, the default page is set to "all users". Making "all notifications" the default one would be more useful. In private team/chat, i sent a message @team but got no notification by email. And yes, i'm part of the teammates.